"The dignity of the African people simply will not be dismissed with 100 years of colonialism and the years of having slavery as the main export," says author, poet, historian, director, performer, and civil-rights activist Dr. Maya Angelou, who in 1996 was named a national ambassador to UNICEF. "You have to stand up for the fellow who's been knocked down," she says. "I am filled with gratitude for those who say, 'I identify with those people because they are human beings, and nothing human can be alien to me.' That's a powerful statement and a powerful thing to do." 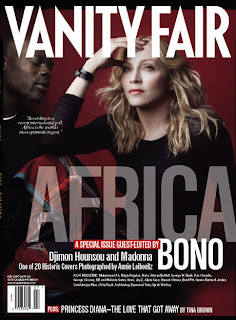 "I asked one of the children in Malawi, 'If you've got the world listening to you, if there's one thing you could say to the world, what would you say?,'" Madonna told Dr. Jim Yong Kim, former director of the World Health Organization's H.I.V./AIDS department. "And the boy said, 'Please just help us forget that we're orphans.'" 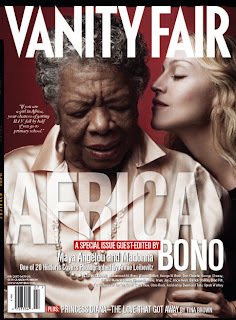 Madonna and Dr. Kim's conversation about the plight of the more than one million AIDS orphans in Malawi is on vanityfair.com; read her own account of her work in Malawi in the Fanfair section.